Last May, I wrote about Changes to DDL Models in PeopleTools 8.48. DDL models 4 and 5 are used by the %UpdateStats PeopleCode macro. 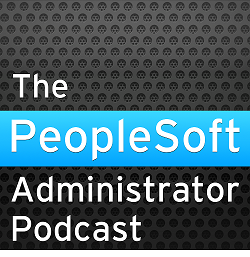 Previously, PeopleSoft had delivered these models with ANALYZE TABLE commands. Now, in line with long standing Oracle RDBMS guidance, they call DBMS_STATS (see $PS_HOME/script/ddlora.dms). I certainly welcome that change. However, I have recently noticed that the DDL models have been swapped over. I have commented on this elsewhere, but I felt it needed a separate posting. I am certain that this is a mistake, but it is at least one that can be easily corrected by PeopleSoft customers. The problem is not obvious because the full compute DDL model actually only uses a 1% sample, and the automatic sample size calculated by Oracle is usually within an order of magnitude of this value, though it is often greater than 1%. This can be easily verified. I wrote a simple Application Engine that collected statistics on two tables via the %UpdateStats macro. I implemented the delivery DDL models as specified in ddlora.dms. This is the Application Engine trace file. Unfortunately the %UpdateStats macro is not fully traced in the PeopleTools trace either (it also reports the same information as the AE Trace file). The only way I know to find out what is being submitted to the database is to enable Oracle SQL Trace, and look in the trace file. So, you can see that RECSTATS HIGH corresponds to the default estimate, but RECSTATS LOW corresponds to the 1% sample size. If you look in ddlora.dms you can see that model 4 is the 1% sample and model 5 is the default estimate. I have kept the 1% sample size for the compute model, but there is no reason why you could not choose a larger value. If you wanted %UpdateStats([table],HIGH) to continue to mean a full compute, then the value really should be 100%. It is really a matter of how long you want to spend analysing statistics on tables during batch programs. However, a higher sample size will not necessarily produce statistics that will lead to a better execution plan! Exactly how Oracle calculates the default sample size is not published. Values in the range 0.5% to 10% are typical. In a perverse sense, a 1% sample size will usually be smaller sample than the Oracle default sample size, so in the delivered DDL models, %UpdateStats([table],HIGH) will usually use a larger sample size that %UpdateStats([table],LOW)! However, I simply cannot believe that this is what was intended. You can see the value that Oracle calculates for auto_sample_size by tracing the dbms_stats call, and looking for the sample clause in the recursive SQL. Eg. Thanks for posting this. I've struggled with this problem for a couple years now. I'd gotten excited about the prospect of dynamic sampling after a conversation with Wolfgang at Hotsos a couple years back, but then ran into the ORA-20005 and was told to get my nose out of the developers' business. Are you really sure 4 and 5 have been swapped? in 8.46, 4 is analyze estimate and 5 is analyze compute. In the ddlora.dms I've got in front of me for 8.49, 4 is estimate 1%, and 5 is estimate with auto sample size. I figured they're using auto sample to do better than 1% but avoid the hit of a full compute.